Years ago in my former life when I lived in NY I had a couple of catered cocktail parties and Mary Giuliani was the one who catered my little events (and I mean little, I lived in a tiny apartment!) She was just starting out, and I remember how delicious and perfectly managed everything was. So now I'm excited to see she has a book out- Cocktail Party Book. I'm sure it is full of fabulous tips and recipes. This Loeffler Randall straw clutch is stylishly laid back for spring and summer outings. I love its texture and design, plus it is the perfect size to fit just about anything! (including sun block!). Pretty and fun these D'Orsay Flats will make all summer dressing a breeze since you will be able to wear these with anything! Just slip them on and go. These Alexandre Birman heels are sensational. They are the prettiest pink, have a comfortable block heel and have little tiny ruffles. If you have pretty toes, ruffles will make your feet even prettier! I would love to try these on! Plus, I'm pretty sure they go with everything. This white and gold desk is perfection in my mind. It is ideal for a home office or as a night table. I adore the look of a desk as a night table, plus it is just so practical to have. I should know, I have one! The straw bag with pink shoulder strap is chic beyond words. What a perfect addition for any spring and summer outfit. 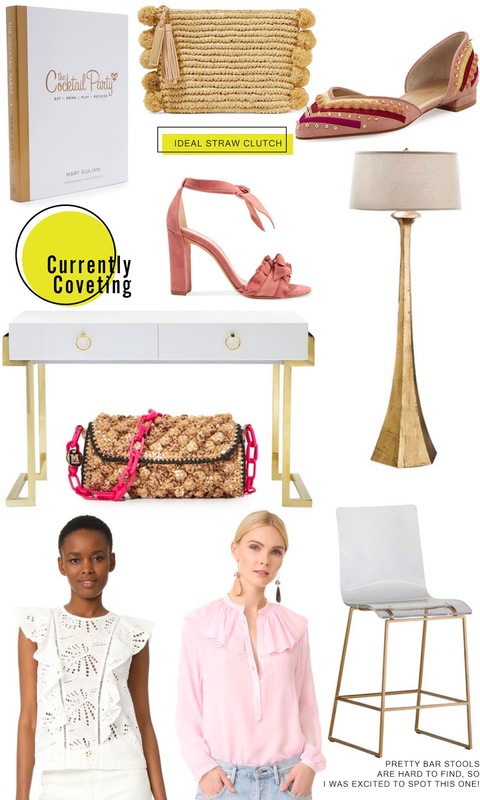 The golden floor lamp is sculptural and chic. I can envision it dressing up any lonely corner, or even better, place it next to a chair or sofa making a perfect reading corner. White eyelet has to be one of the prettiest inventions ever. It just makes everyone more beautiful. This eyelet top is EVERYTHING you will need this summer. The pale pink top with ruffled collar is sweet and feminine. Pair it with jeans, shorts or a skirt for a whole 'lotta prettiness. The best part? This color looks amazing on ALL skin tones. It is hard to find a pretty bar stool. I think it is because of the weird dimensions ( a taller chair? ), but I loved the simplicity of these acrylic bar stools with gold legs. They are elegant but disappear from sight.